Case Slim is available in over 250 colours and special finishes along with a concrete finish and a version with a mirror. A functional towel rail can match the radiator colour or become an eye catcher when ordered in a contrasting colour or chrome finish. . A 50 mm thermostatic valve and stylish SLIM thermostatic head is included together with ALUPEX and copper pipe adapters. Available in water, water-electric and electric versions. Heat output: 422-762 W.
You can order custom graphics for your Case Slim radiator. Just select the product size and send us a properly prepared file with your own creation. 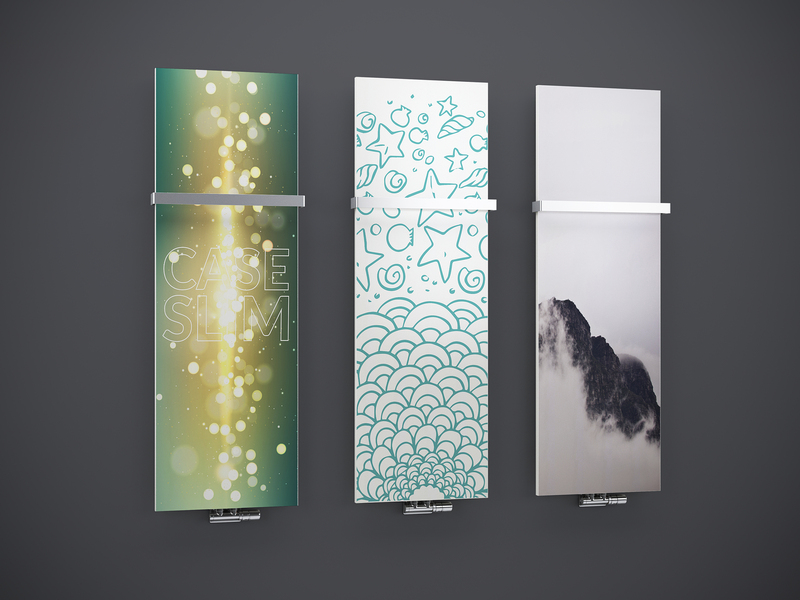 The most convenient option is to use the order form available on our website: Custom graphics for Case Slim – order form. Submitting a custom graphics form is free of charge and does not constitute a product order. The order form generates a code for your custom graphics radiator. In order to purchase your radiator you need to present the code to any of our Trading Partners.